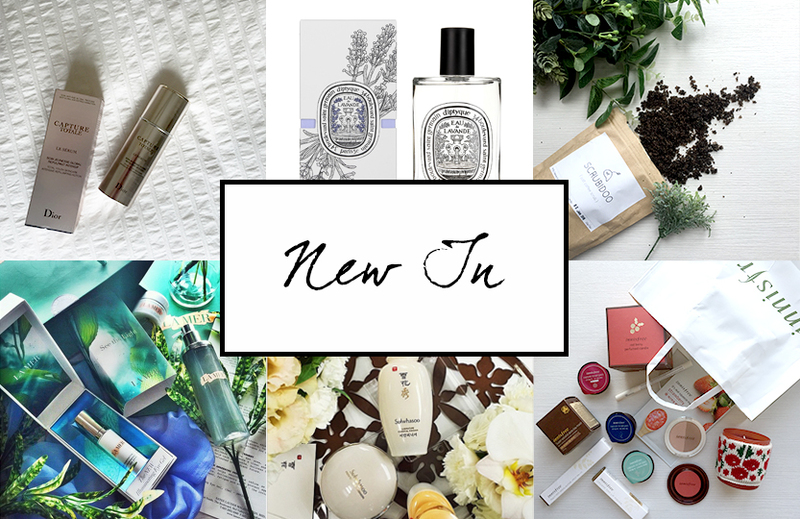 So here's the next installment of 'New In', featuring some Dior, some La Mer, and some exciting brands that are completely new to me. Enjoy! This luxurious bottle is brand new to the Dior skincare family, and I am so excited to be able to share it with you. On me, this lightweight serum simply made my skin firmer and plumper, but on my parents, whoa! It smoothed down fine lines, reduced sagginess and increased the firmness and overall health of their skin. It's one of those products that my parents fight over to make sure that the other doesn't use too much of it. I have the same complaint I have of all Dior skincare - I don't like its artificial fragrance, but it's something I'm willing to overlook if it continues to perform with such promising results. After I received this perfume, I happened to read about it in an article on an online magazine. The article was about fragrances that 'turn a guy on' (sorry, it's very early in the morning as I'm typing this, and I can't figure out a less-vulgar, yet not-so-formal way of saying this), and hails lavender as a great turn-on-er of men (again, I apologise for the lack of grammatical prowess). diptyque eau de lavande was recommended for its authentic, musky scent. I thought the article was interesting, but I was sold by this fragrance way before the article came along - it's deep, earthy, and just so beautiful and mature - nothing like the light, girly flower scents that most major perfumeries produce. I am a huge fan of these kinds of fragrances, but I must admit that they're not for everyone. If you're ever near a diptyque counter, head over and try this on first - it just might surprise you. I must admit that the reason why I even agreed to try Scrubidoo is because the people over at Scrubidoo HQ are total sweethearts. I love their approach to PR, and I really appreciate people like that! That being said, I also love their product and that's why I chose to share it with you guys. I received the coffee scrub to trial, and it made me really excited because coffee granules are known to help reduce the appearance of cellulite. Now the thing about cellulite that most people either don't know or choose to forget, is that it can happen to anyone. It's genetic, and it happens when the body chooses to store fat in a different way. Even a skinny girl can have fat, and that's why cellulite could happen to just about anyone. So I tried the scrub out, and sadly nothing happened to my (already barely visible) cellulite. It did, however, completely rid my skin of dry flakes, plus it moisturises the skin whilst it exfoliates, so my skin was left feeling silky smooth and almost buttery once I was done. These scrubs are made fresh and therefore have an expiry date, so be warned that you will need to be consistent with your use of these products if you're gonna get your money's worth (I like it because it forces me to be diligent with caring for my skin!). You can get Scrubidoo at www.scrubidoo.com. The Just Coffee Scrub retails at SGD$17.90 for a 220g packet. Now you guys know that I love La Mer. I love their PR, I love the luxuriousness of the brand, heck, I even love the beautiful aquariums at the brand's counters. I'm a huge fan of their Moisturising Soft Cream, but I just couldn't bring myself to love the Illuminating Eye Gel. I know that I'm always harping on about wrinkles around my eye area, so let me premise this review by saying that I do read what the product is meant to do and I know that this eye treatment doesn't target wrinkles, so that's not what I looked for when I trialled this! What I like about this eye gel is that it's much lighter than the other La Mer products, so if you find other La Mer products too heavy for your skin, this might still work for you. My eye area is particularly sensitive towards heavy eye creams, and I tend to develop milia around my eye area with most eye creams, but not with this one! I love the way it hydrates the skin around my eyes and sets it up perfectly for undereye concealer, without making the under-eye area too oily or slippery. However, I found that this eye gel didn't brighten up my eye area at all, so I don't think this is something I'd repurchase. This brand, spanking new product really caught my attention when I heard about it. Sulwhasoo is a brand that stays true to its Korean heritage and roots, so it's no surprise that this product was inspired by a skincare product created and used 1,500 years ago by Korean royalty. It is a 'skincare finisher' - a product that seals in your skincare to aid the absorption of said skincare and to prevent damage caused by external pollutants. It is chock-full of antioxidants (Sulwhasoo has patented an optimised complex of ginseng and green tea for this - called Locsamhyo™ - and packs a punch equivalent to 5 roots of ginseng and 110 cups of green tea per bottle) and helps to keep the skin clear and luminous. I honestly don't even know if such a skincare product is necessary, though it certainly has shown some benefits - my skin does look brighter and more luminous, and makeup sits beautifully on top of this product. My skin always looks like it's glowing when I use this product underneath my foundation. I'm in love with the finish, and it looks like I'm not the only one, because this product has broken the record as Sulwhasoo's most successful product launch. One thing I noticed when I used this, though, is that my skin gets quite oily by noontime whenever I have this product on. It's nothing a quick powder touch-up won't fix, but it's something to take into account before you purchase such a pricey product. This launches in January 2015 here in Malaysia and will retail at RM280 per 80mL bottle. This is more of a general overview of a brand that's brand new to Malaysian shores - Korean eco-beauty powerhouse Innisfree. This is a brand that gives back and makes the effort, with forest conservation efforts, all-natural skincare, and recycling and reusing policies that would make a hipster proud. I am in love with almost all their makeup products (try their powder highlighter - it's my favourite product), and have recently developed an obsession with their masks. Their first store opened in Sunway Pyramid (good thing too, cause I'm always there) and I'm sure there's more to come!